Our women was a magazine in the 1950s and ’60s which focused on the social issues, contributions and opinions of women in Australia. The Library’s Chess Collection reflects Victorian’s long enthusiasm for the game. As far back as the 1850s, slums existed in inner city Melbourne. In the 1930s, Frederick Barnett began taking photos of the slums, using them in a push for social reform. Melbourne’s love affair with coffee has been long-term, passionate, and sometimes controversial. The Library has recently digitized a collection of photographs of homeless people from the 1960s and 1970s. Melbourne’s Moomba festival first took place in March 1955 and was initiated to liven up Melbourne and attract tourists. 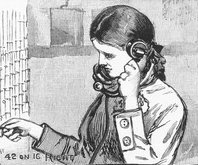 You’re the first person in the world to answer the telephone- so what do you say; Hello? Hulloa? Hi? Anybody there?